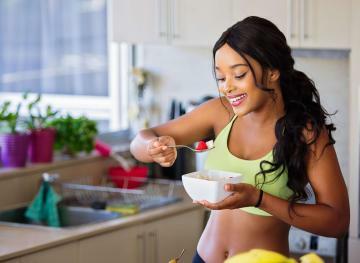 Regardless of whether you’re an avid exerciser who’s perpetually facing lactic acid buildup in your muscles or a newcomer who overdid it a little on a hike yesterday, sore muscles are nothing to scoff at. Stiffness and tension knots can often lead to full-on muscle pulls and mini tears if you don’t take enough time to stretch things out and relieve that pain you’re experiencing. And while those therapeutic minutes aren’t the most fun, the tools below can make them not only more tolerable, but also more effective. From your neck to your back to your legs to your feet, here are the best (and affordable) tools for soothing super sore muscles that are worth adding to your home gym collection. 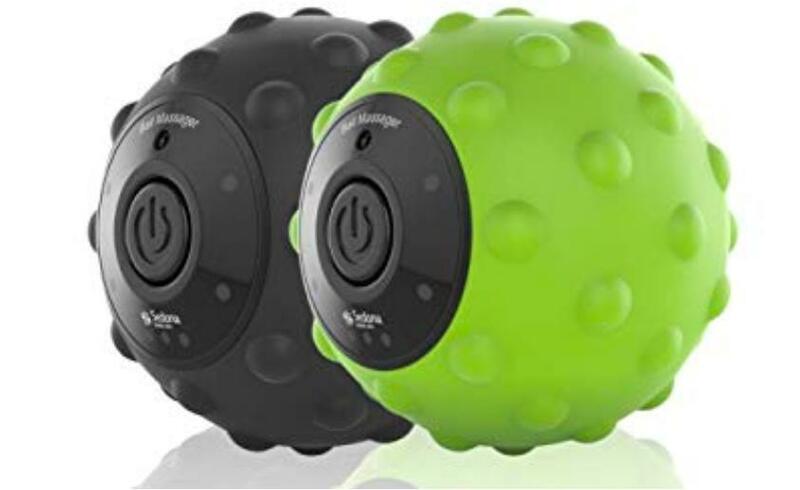 This pair of massage balls can help you work out even the toughest of knots around your shoulder blades and along those tough bands of muscle on either side of your spine. The portable set features four vibration intensity levels so you can achieve the kind of relief you need, depending on the kind of soreness you’re experiencing. The textured surface also makes them effective massagers even when you leave the vibration option off. Not to mention, their battery life is super impressive (and the portable charger makes your life easy when they do finally need some juice). If you hold a lot of tension in your neck and shoulders, this combo is a must-buy for your home. The multi-point massager base fits perfectly in the curve of your cervical spine, and the material is plush enough to be gentle but tough enough to help you work through any tension knots you may have. Just gently rock your head from side to side and up and down and feel all of those little muscles loosen. 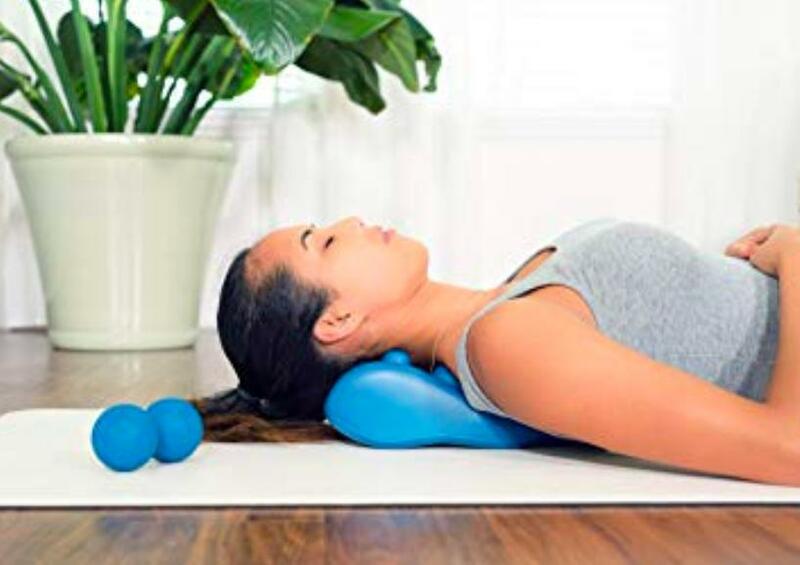 The peanut-style massage ball is also helpful for any pain you’re experiencing along your spine because the hollow center leaves room for your vertebrae while the rubber ball ends target the bands of muscle located on either side. This list wouldn’t be complete without a classic foam roller, especially when it comes to your hamstrings, IT bands and calves. But we picked a sturdier, textured model here because of its ability to add variability in how it massages your tight and painful fascia. You can achieve deep tissue massage and myofascial trigger point release in the comfort of your home with this simple tool and avoid breaking the bank at the same time. Fair warning: It’s rarely comfortable to use a foam roller, but when it’s all said and done, you’ll be glad you put yourself through those brief minutes of circulation-stimulating and lactic acid-releasing torture. 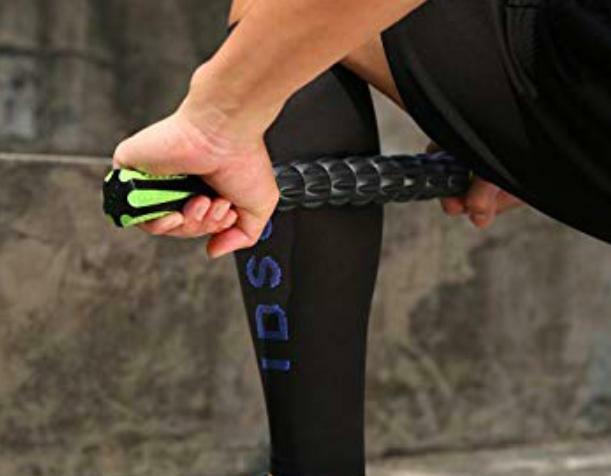 This high-quality, well-designed muscle roller is a budget-friendly buy that’ll bring quick relief to super sore leg muscles. The lightweight, handheld stick allows for the ultimate customization in how much pressure you’d like to apply to your calves, quads and more, as well as how quickly you’d like to roll them out. We like to use this guy both before and after workouts to reduce muscle pain and stiffness and improve our circulation. The best part? You can take it with you anywhere. Just toss it in a backpack or gym bag, and you’re good to go. These foot stretchers and massagers are ideal for runners, yogis and really anyone who spends a fair amount of time on their feet. They can help you develop strong and well-aligned toes, feet, ankles, knees and legs, as well as prevent future injuries. We like to stretch the balls of our feet on top of them after wearing constraining high heels and even hiking boots for extended periods of time. And for those who struggle with plantar fasciitis, balance on the center of the SoleHealers and slowly rock back and forth on your arches to let the micro-ball design massage the various tissues along the bottoms of your feet. 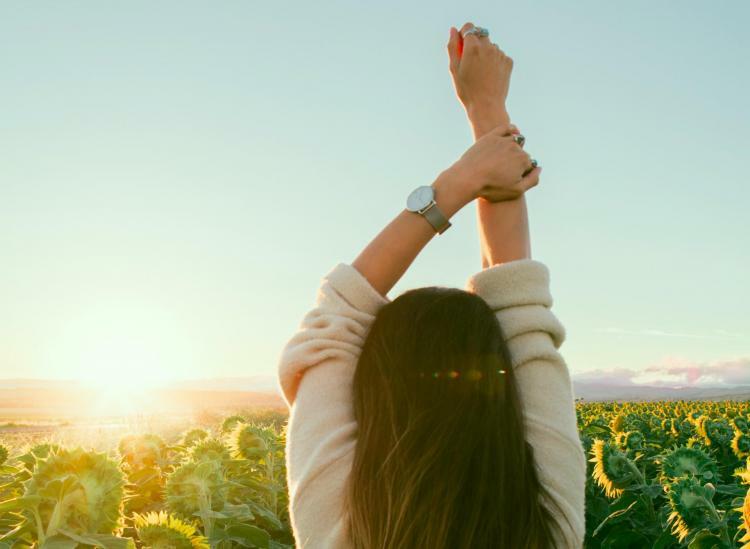 It’s amazing how much time we spend scrunching our toes together, from the restrictive shoes we decide to wear to the subconscious reaction we have when we’re stressed or anxious. 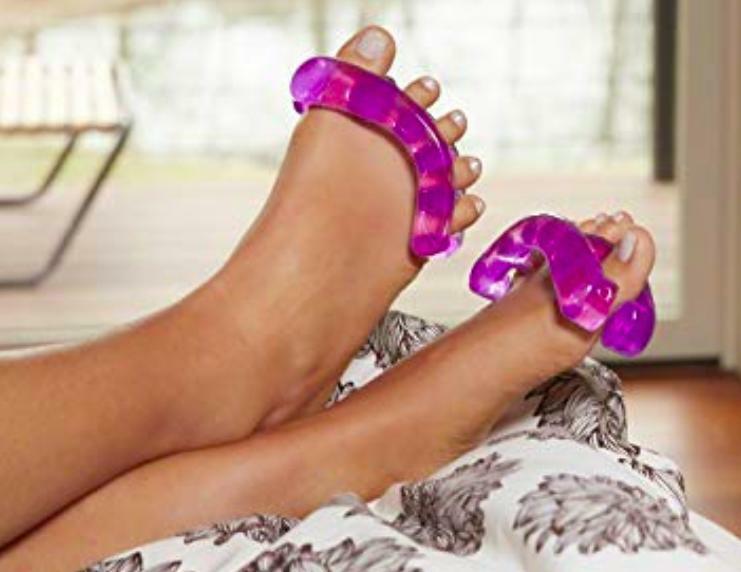 But these little toe-separating contraptions help to expand that space between your toes again, strengthening the small muscles in your toes and feet and increasing your flexibility. If you unwind with these guys at the end of the day, toe and foot cramps will become a distant memory of the past (and you might even find that other supporting muscles in your ankles and lower legs will relax, too).